Another favorite site, and one that is a bit off the beaten path, but well worth a visit. There is a visitor center and campground, other visitor services are an hour away, so plan accordingly. There are several ruin locations besides the main area, which the staff at the visitor center will provide directions. The 1-1/2 mile Ruins Trail. 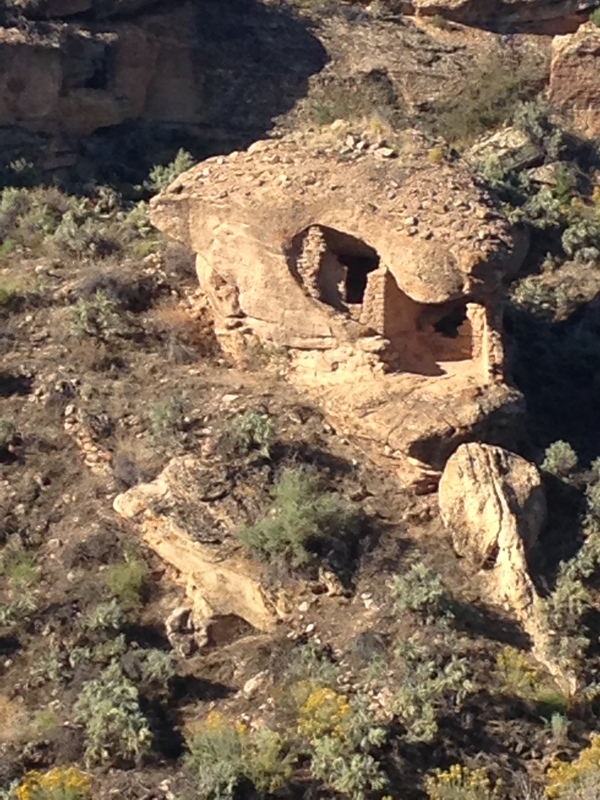 From the visitor center or campground is an excellent hike which takes you past numerous ruins. Even though this is not considered Senior Friendly as an upper age limit is given, however the staff was encouraging of this Senior. There are three ages groupings; ages 6 and under, ages 7 to 9, and ages 10 to 12. To earn the award each person needs to hike at least one trail and complete the required number of activities based on the age grouping. The youngest age group completes 3 activities and is designated by a paint pot design. The middle age group completes 4 and 3 must be marked with the ruin symbol and the oldest age group completes 5 activities and 3 are marked with the arrowhead symbol. Activities include; Welcome (hike), Design your own Jar, Maze, Connect the Dots, Bingo!, What’s wrong with this picture?, Word Search, Crack the Code,True or False?, Crossword – Protect the Past, and Observations. By far, my favorite activity was the hike along the Ruins Trail. 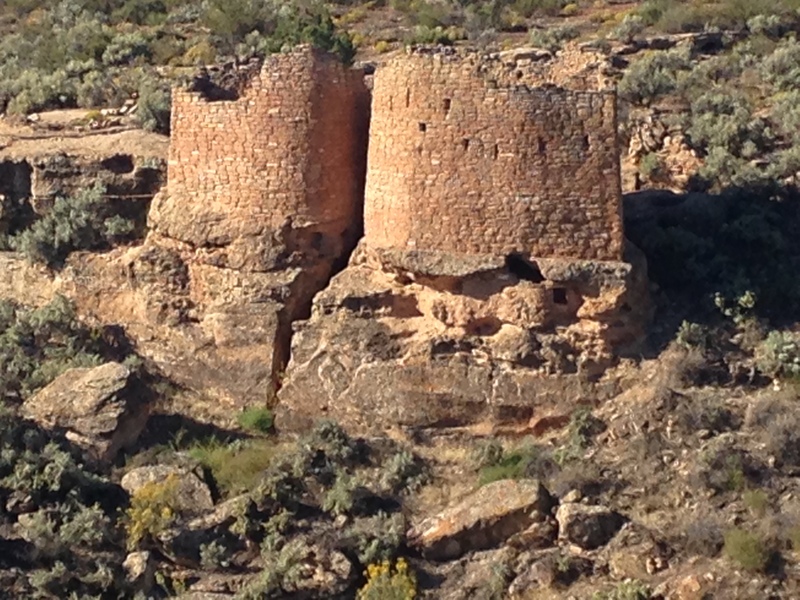 These ruins are set along the rim and down inside the canyon you hike which allows for some up close views. The trail has a few ups and downs, but is easy to complete. The last page in the booklet, Observations, has you record things you heard, saw and smelled along the hike. The weather was great the morning I hiked. I also enjoyed decorating an ola, water jar, using colored pencils. The True or False? page had 12 statements that you could determine whether they were true or not by looking at the park brochure and signs in the visitor center. 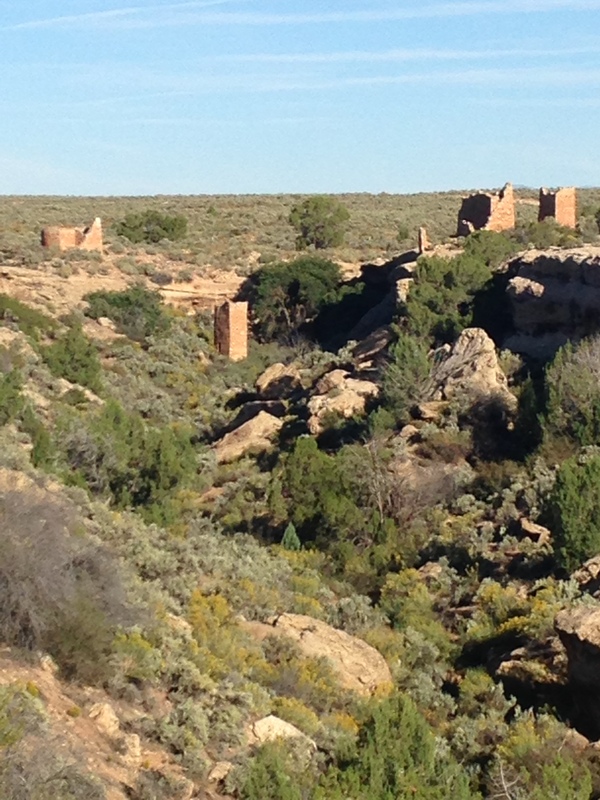 I learned that the ruins built as towers were only occupied for a short time, compared to how long the ancestral Puebloans lived in this area. The Crossword-Protect the Past tested your knowledge about protecting archeological sites, always a good reminder. I took my completed booklet to the visitor center and had it checked by a staff member. 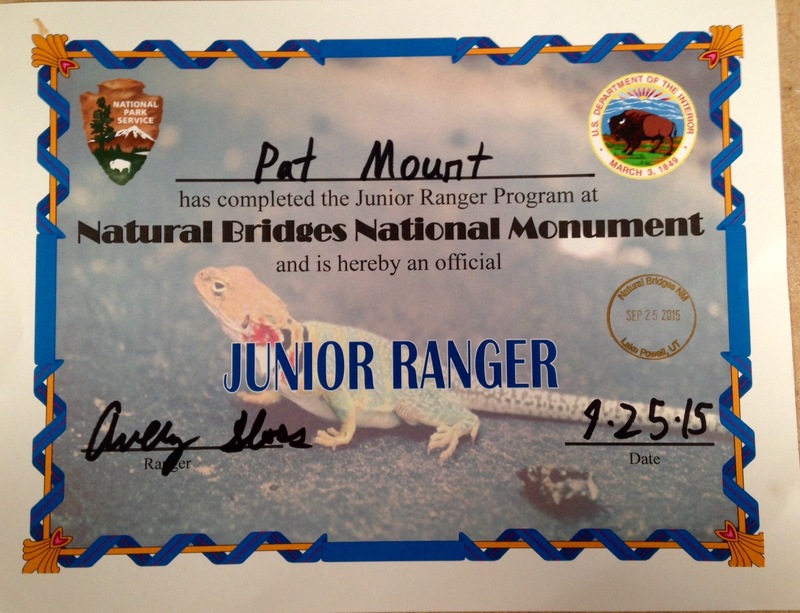 After signing my certificate I was awarded with the enhanced Junior Ranger badge. Another return visit to this beautiful site, and an opportunity to complete their Junior Ranger program. Even though we arrived right after lunch the campground was already Full. With only 12 camping sites this campground always fills early, especially in the Fall. 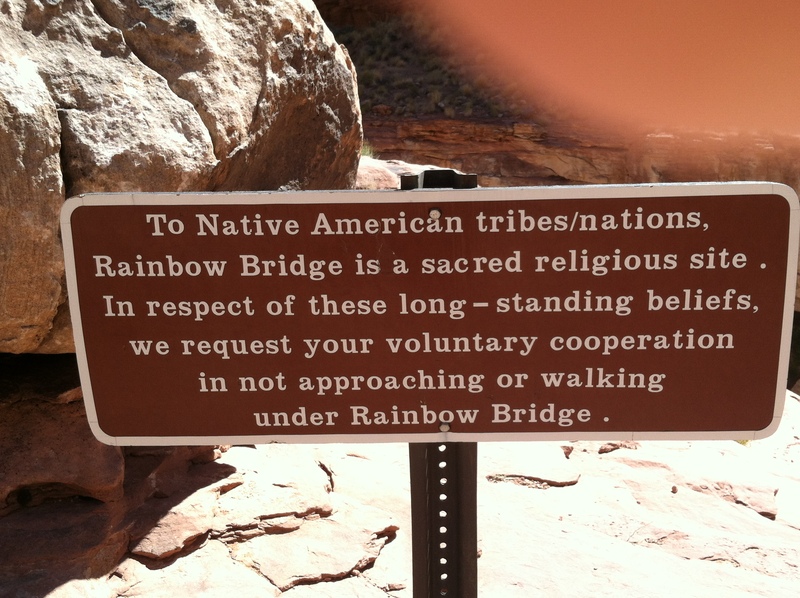 But, the bridges are always there to be seen by driving the scenic road or hiking. This program is considered Senior Friendly as there are 3 age groups and no upper age limit is given. The three age groups are; Modest Mouse for ages 4-6, Rockin’ Raven for ages 7-9, and Cool Coyote for ages 10 and up. To complete the program you need watch the park video or attend a ranger program and complete activities according to your age group; 3 activities for Modest Mouse, 4 activities for Rockin’ Raven, and 5 activities for Cool Coyote. The activities include; Take a Hike!, Bridges Bingo, Desert Dwellers Word Scramble, Bridge Formation:Spanning Time, What’s Wrong? What’s Right?, Cryptic Crust, Creative Corner, Canyon Criss-Cross, Make the Connection, Watch Your Step!, Rock Art Adventure and Interview a Ranger. This was a fun bingo activity, specific objects were not given, but more activity-based. Squares included; find 3 green things, see some rock art, smell a tree, feel some sandstone are some of the examples. The word scramble was a great learning experience. The scrambled word was given at the end of a statement about plants and animals found in this park. Bridge Formation:Spanning Time provides a page of information about how bridges are formed, then the second page has you put in order 6 sketches showing the sequence. Creative Corner had you write a poem in cinquain format; not rhyming, but a short 5 line poem using phrases to describe something you experienced while at the park. The subject of mine was sky. The most involved activity was the Canyon Criss-Cross, a crossword puzzle with 30 words. Help with the answers could be found in the park brochure, exhibits and in the park video. I did need to get some additional help from a ranger, who was happy to help. My Rock Art Adventure depicted birdwatching, a favorite activity while I am traveling. As always I enjoyed learning more about this beautiful park site. 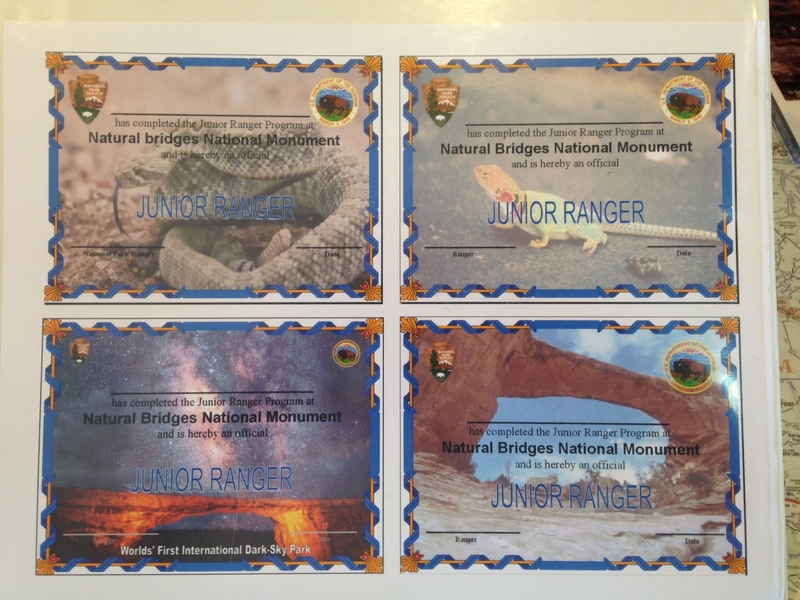 After the ranger checked my booklet and awarded me their enhanced badge I was given a choice of the most attractive certificates of any Junior Ranger program I have completed. This national park is very large and spread out over several districts. 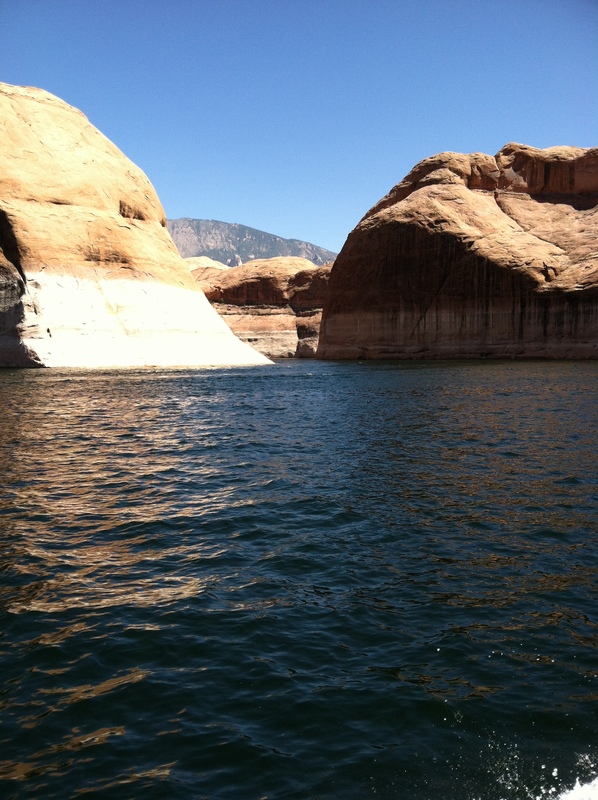 I visited Islands in the Sky and Needles Districts on this trip. 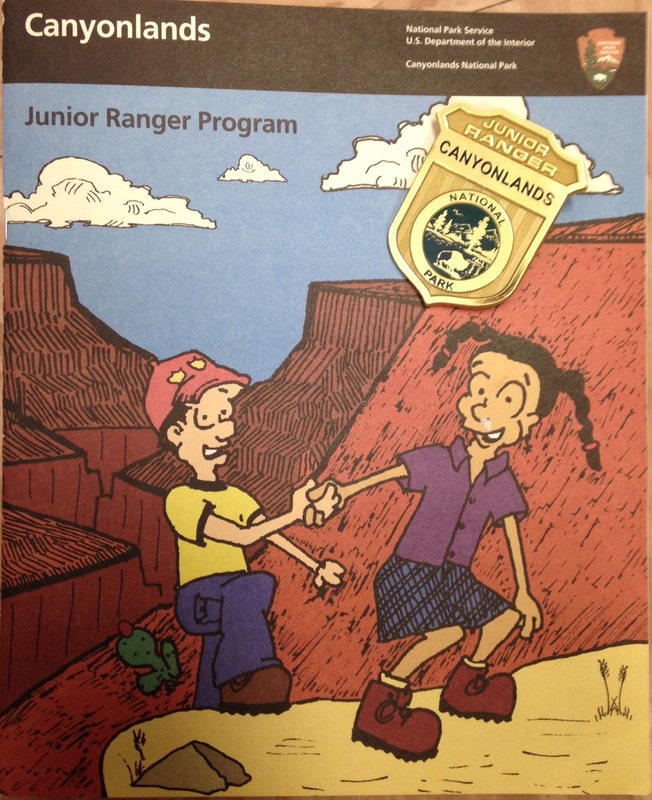 While visiting Islands in the Sky area I picked up the Junior Ranger booklet to begin working on the activities. A couple of days later I had the booklet reviewed while visiting the Needles area. This program is considered Senior Friendly as there are 3 ages groups and the oldest does not have an upper age limit. The groups are; Leapin’ Lizard ages 5-7, Rowdy Rabbit ages 8 – 10 and Bouncin’ Bighorn ages 11 and up. To complete the program you are to complete the activities for the specified age group; at least 4 for the first age group, at least 5 for the middle age group and at least 6 for the upper age group, watch the the park video, attend a ranger program or pick up litter and have a ranger check the booklet. The activities include; Ready, Set…Hike!, Where in the World, Canyonlands Crypto, Connect the Dots, Star Search, State of Erosion, Layering Logic, Protecting Our Park, Who Am I?, The Ancient Ones, Cowboy Maze, Park Poetry, Discovery Walk Bingo, Puzzling Plants Crossword, and Our National Parks. 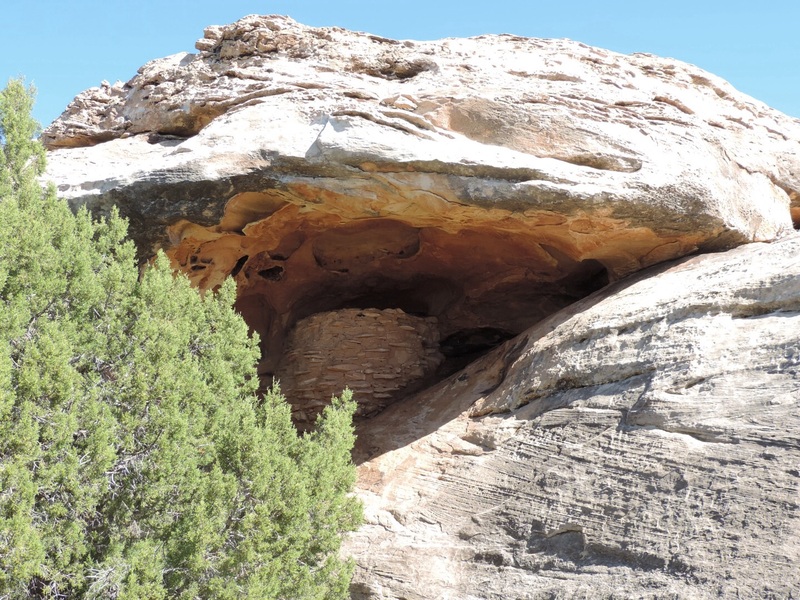 Canyonlands Crypto helps you understand the importance of staying on trails to protect the unique and fragile soil in the SouthWest. By using a word back you fill in words in a paragraph that describes cryptobiotic soil. 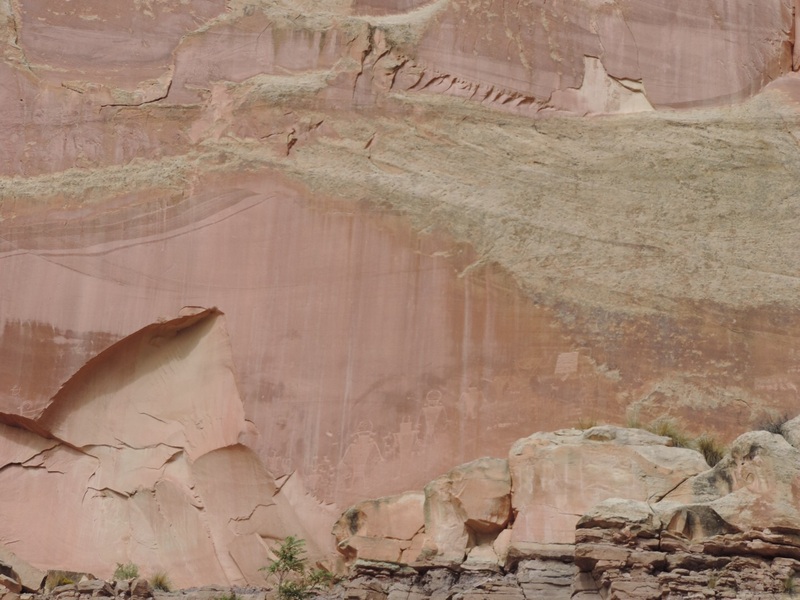 State of Erosion has you identify pictures of different types of landforms and use the park map to find names that match four landforms found in the park. 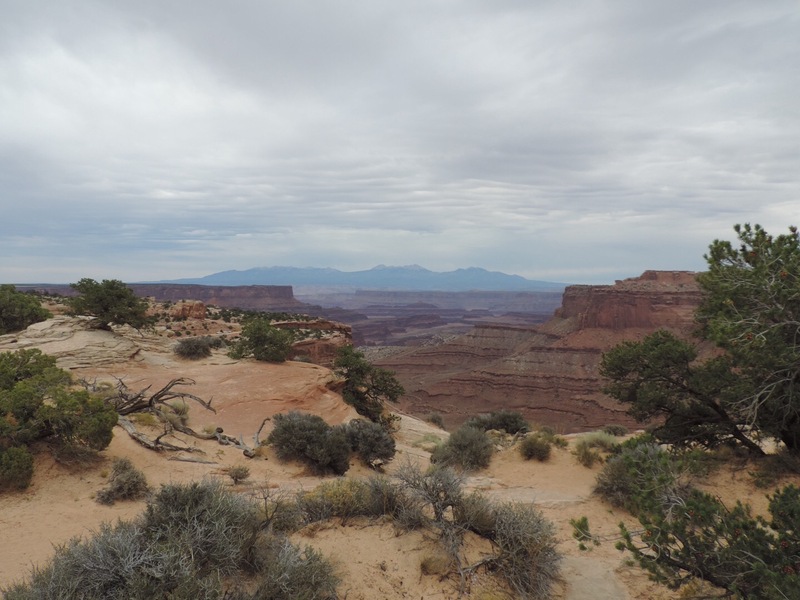 For Park Poetry you are to write a cinquain poem about something you saw in Canyonlands. This is a simple style of poem that does not have to rhyme, but describes a subject you chose. 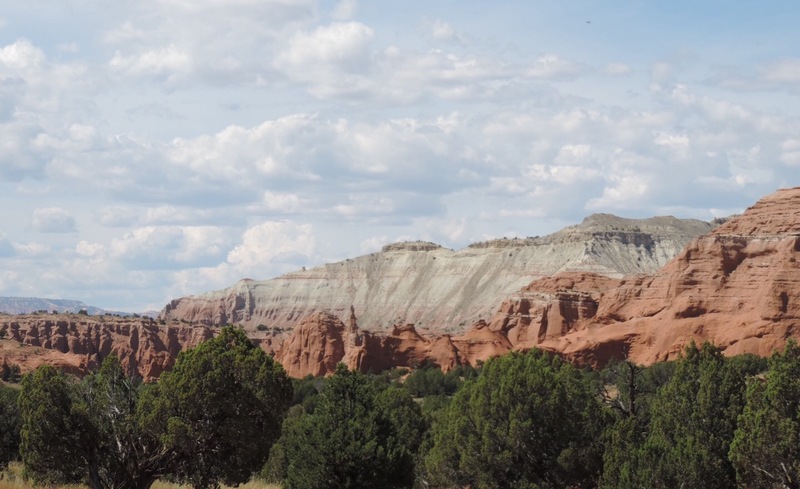 I wrote about the vistas, which are vast and beautiful. Discovery Walk Bingo is always a great way to keep you looking as you travel through the park. Instead of finding specific animals, plants or objects the squares ask you to write or draw ‘something’. Something – soft, prickly, beautiful, you smell and 12 other description. The Puzzling Plants Crossword had a twist from other crossword puzzles, the words in the word bank were anagrams (letters mixed up). So besides figuring out the answer to the crossword statement you had to unscramble the letters. The statements gave good information about plants to this unique environment. 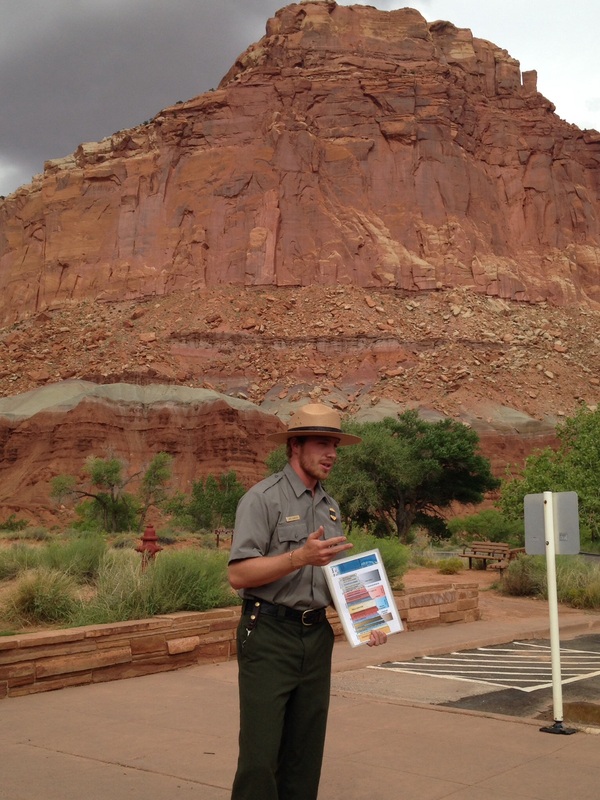 After spending a couple of days in the area I had a ranger check my booklet while visiting the Needles District. 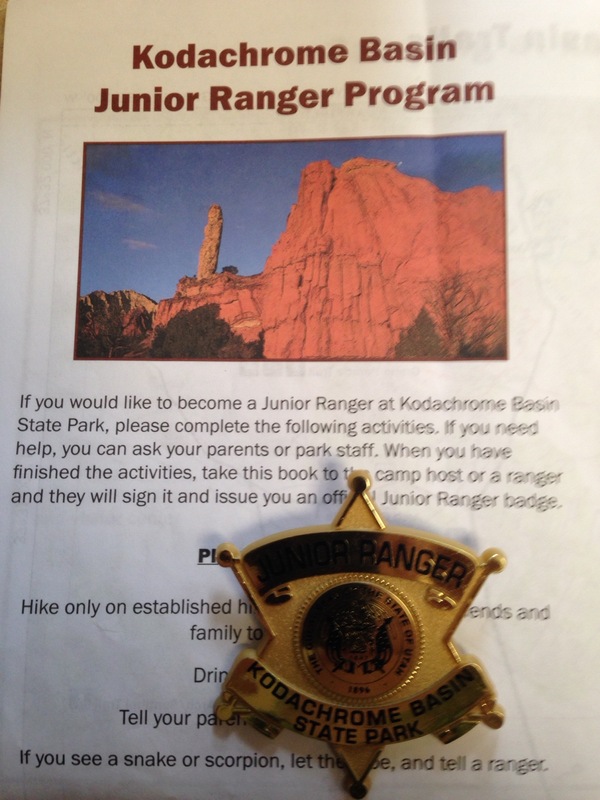 The ranger signed the Certificate of Completion in the back and the booklet and awarded me the badge. 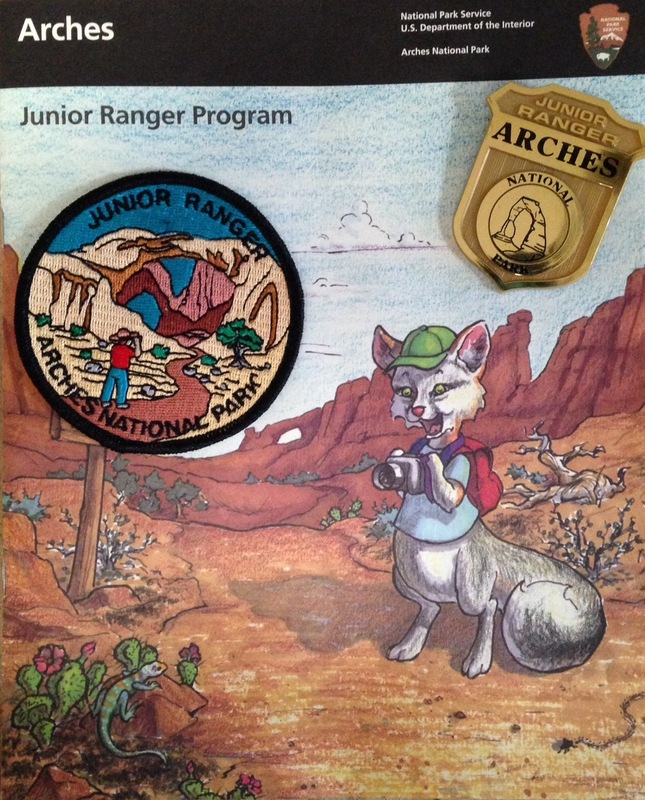 I picked up the Junior Ranger Program booklet as I entered the park the first day I arrived in the area. There are no age requirements so it is considered Senior Friendly. Inside the front cover the instructions indicate that you should attend a ranger program or watch the park movie, pick up some letter, complete 3 starred activities plus one additional activity. The activities are; A Place of Your Own, Draw a picture of the place you chose, Arches Rocks, What They Leave Behind, Rock Art Record, Plant Pursuit, and I Was Wondering. 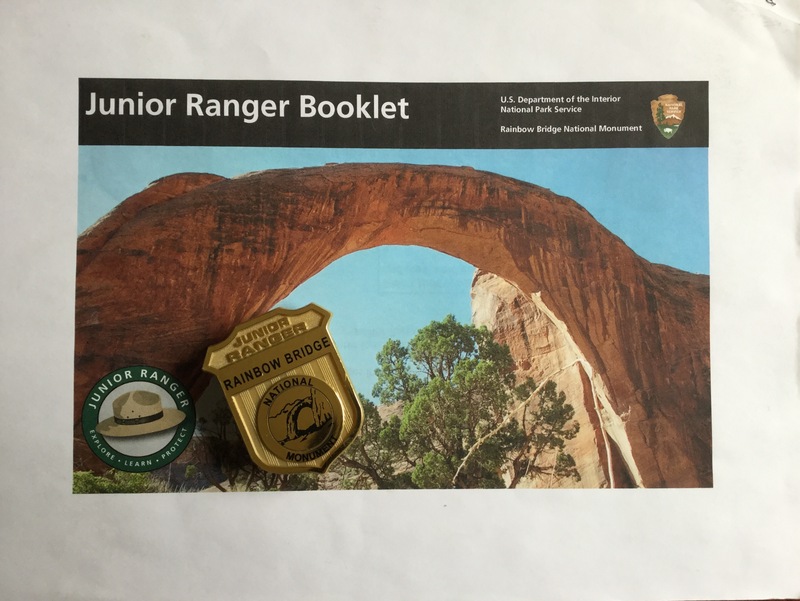 Overall the this Junior Ranger program is fairly easy to complete within a day’s visit. 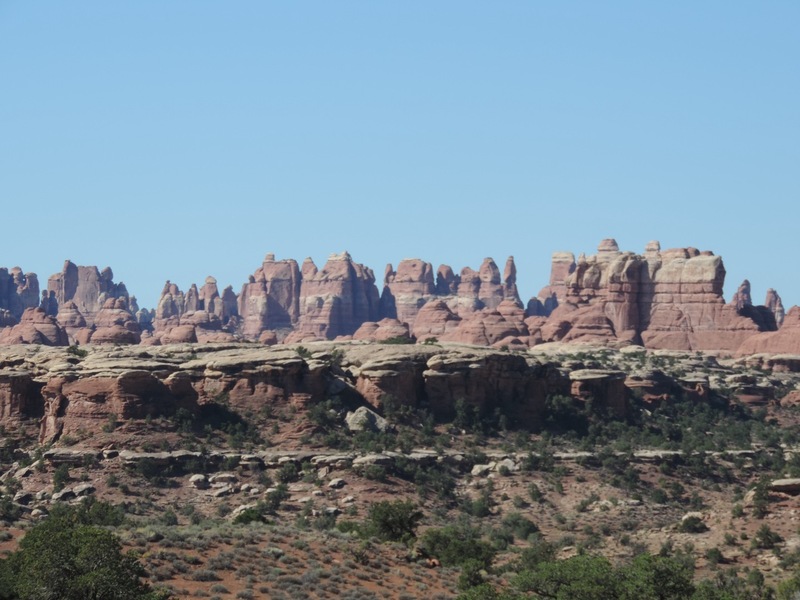 I watched the park movie and learned that there are over 2000 arches within the park, the greatest concentration on Earth. 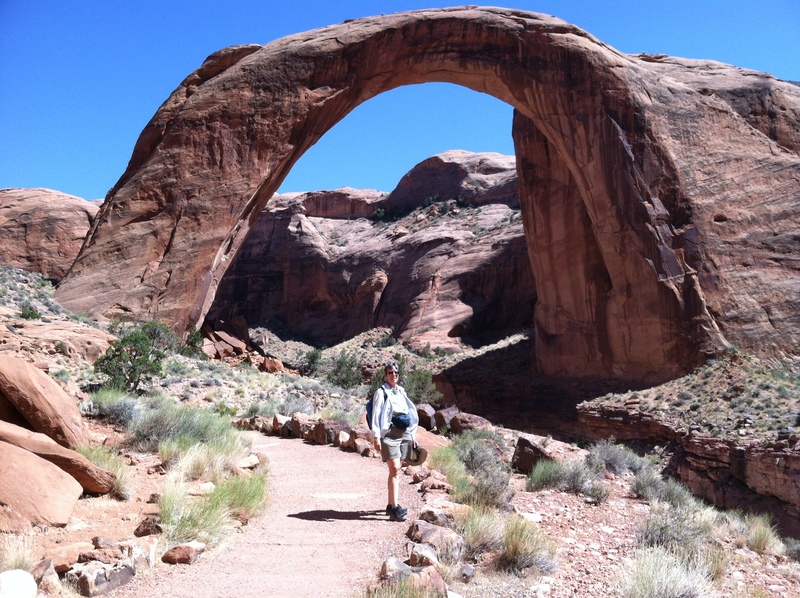 Later, from a ranger we learned that most of the arches have been discovered since the 1980s. For A Place of Your Own I chose The Windows area to identify 3 reasons why it is my favorite place; towering rock walls, many colors and a variety of geologic formations. I drew a picture of the wall of rocks up behind the visitor center. 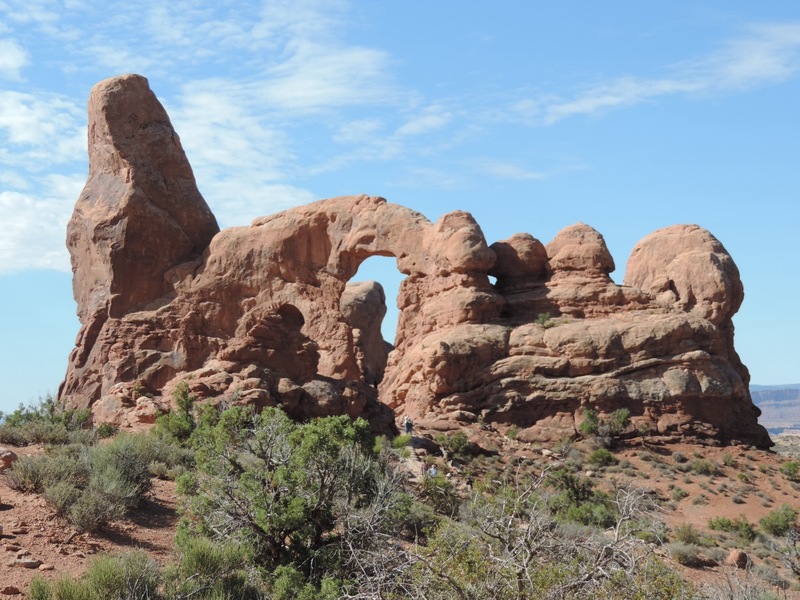 I was surprised at the variety of rock types and colors which I learned when I completed Arches Rocks. Other activities involved animal tracks, rock art, and plants. The final activity had you come up with a couple of questions that you thought about while visiting the park, and two things to research after your visit. When I turned in my booklet for review by the ranger he had me ask the questions and we had a very nice discussion. I really liked having this interaction with the ranger. The ranger signed my certificate of completion and issued an enhanced badge. 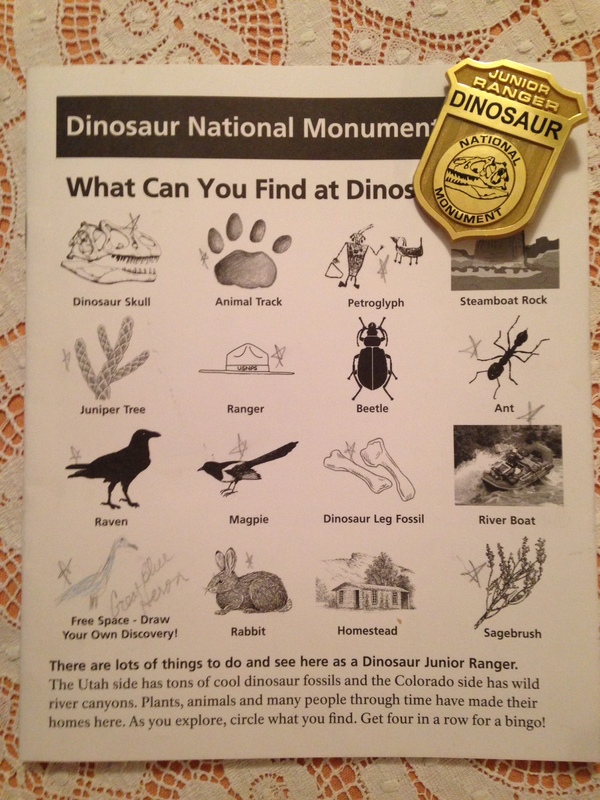 On a previous visit to this site I completed the Junior Paleontologist program. The activities are; What Can You Find at Dinosaur?, What is Important to Protect?, How Did the Fossils Get Here?, Can You Find the Skull?, What Was That For?, What Do Dinosaur Names Tell Us?, Can You Visit Without a Trace?, Animal Tracks Guide, What Do Animal Tracks Tell Us?, What Have You Discovered?, Why Should Echo Park Be Protected?, Who Lived Here First?, How Did Homesteaders Survive?, and How Will You Explore, Learn & Protect as a Junior Ranger? Most of the activities are fairly easy to complete, but interesting. I enjoyed translating the dinosaur names from Latin to English for the activity “What Do Dinosaur Names Tell Us? The page for Animal Tracks Guide was useful, as this is frequently needed for many Junior Ranger programs, and provided good drawings and details of nine different animals. I observed some prints near the campground, after sketching them I was able to use the guide to identify them as rabbit prints. I like to try my hand at drawing and carry colored pencils with me as I travel. I completed a drawing of the rocks across the river from the campground for What Have You Discovered? activity. There were many layers and levels to include in the picture. The simple crossword was based on homesteading terms, specifically for the Josie Bassett Morris homestead within the park. The maze for Can You Visit Without a Trace? was very well designed. Besides finding your way through the maze, you had to make decisions to avoid harming the environment by following the Seven Principles of Leave No Trace. After visiting the Quarry Exhibit Hall on my last morning to finish the booklet I turned it in at the visitor center. 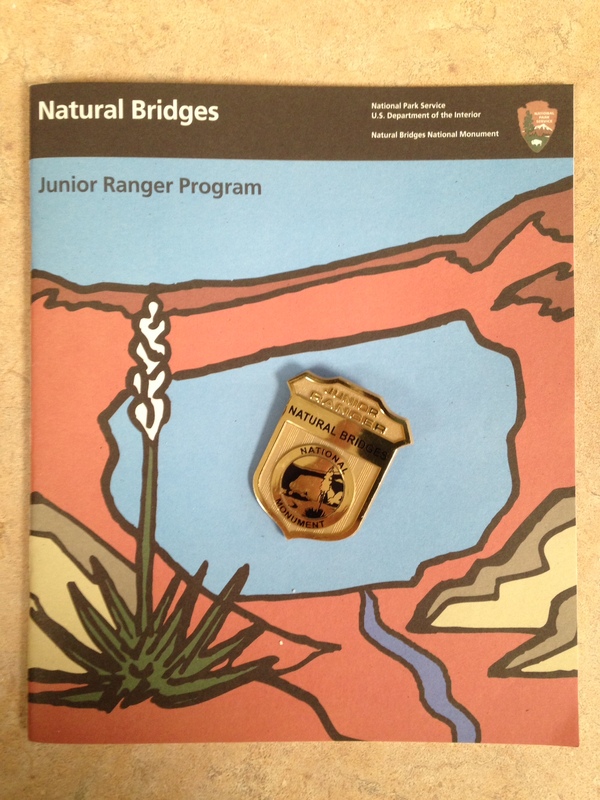 A ranger reviewed the booklet, had me recite the pledge and awarded me the enhanced Junior Ranger badge. 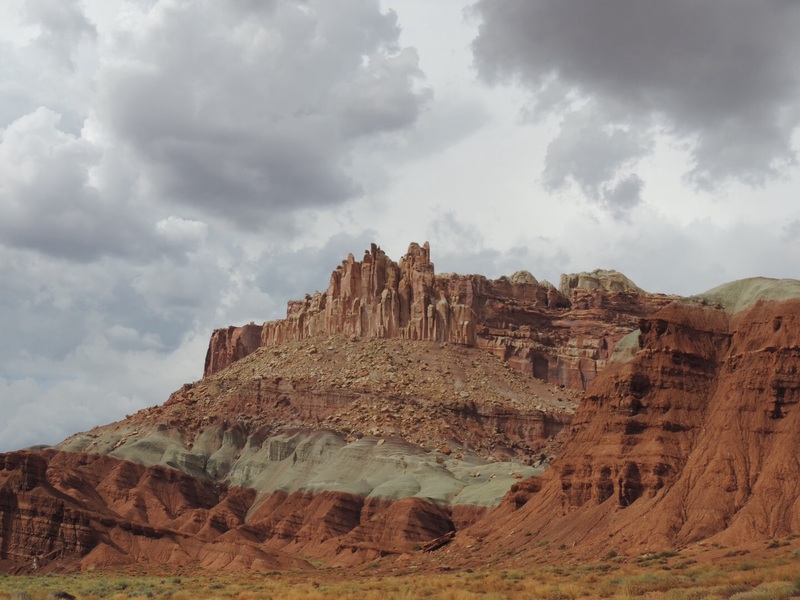 Capitol Reef is a very favorite NPS site, a place I have visited numerous times over the years since my first visit in 1975. 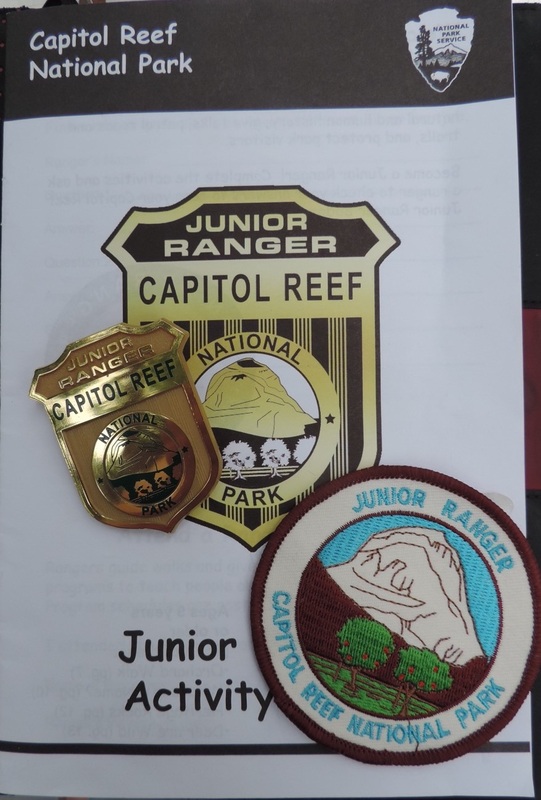 However, until this visit I had not completed the Junior Ranger program. The first goal of this visit was to get a campsite. Our last visit in October 2012 we arrived by 4 PM and missed getting the last campsite. Today we arrived by 2:30 and had no trouble getting a space – yeah! 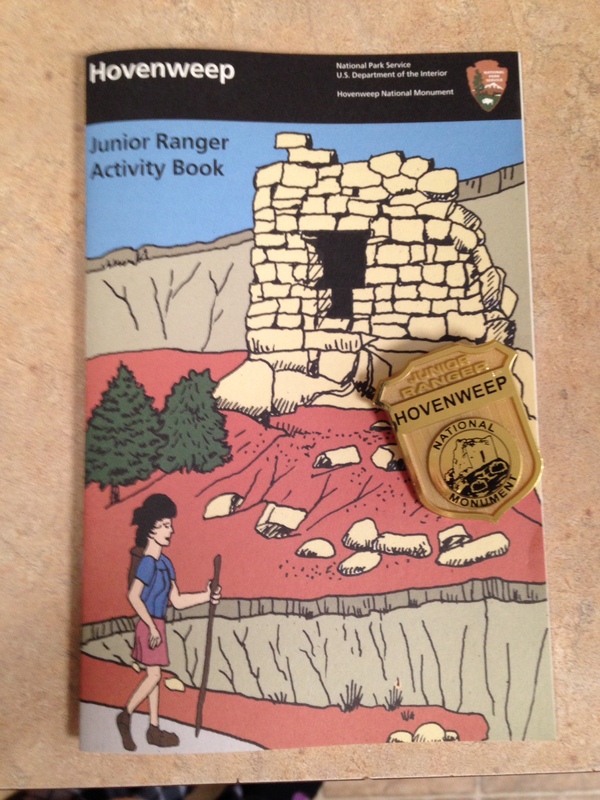 Once we had a campsite I went to the Visitor Center to pick up the Junior Ranger Activity Book. The booklet gives two age ranges; 8 years or younger and 9 years or older. This program is Senior Friendly as there is no upper age limit. To qualify for the award the follow activities need to be completed: Ranger Interview or Attend A Ranger Program, Responsible Rangers, A Clean and Safe Park, and National Park Sites for both age groups. For the older age group 3 of the 4 following activities need to be completed; Orchard Walk, What’s In A Name, Heritage Rocks and Deer are Wild. I completed all of the required plus a few additional. The Ranger program by Ranger Nick was excellent. 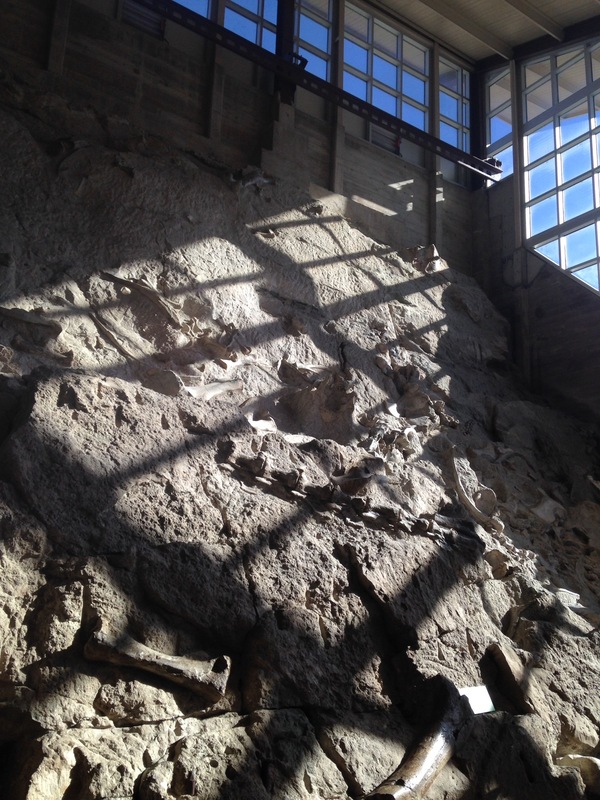 It was titled “Life Within the Layers”, presenting the four primary types of fossils that are found within the park. I appreciated that he gave out a handout of the geologic layers, this made it easy to follow the information he provided. 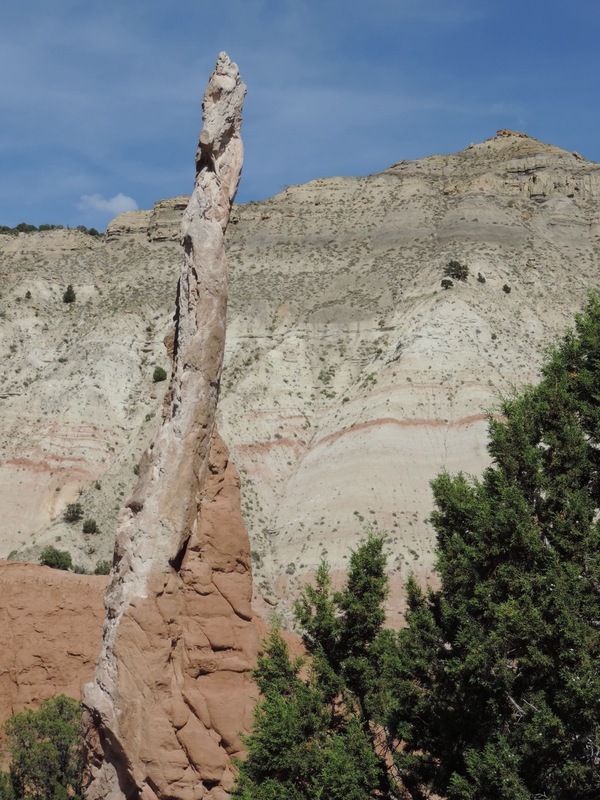 After discussing the fossils he had a sample of each to pass around; swim smears in the Moenkopi formation, petrified wood and roots in the Chinle formation, fern leaf and oyster shell, both during the Cretaceous period. 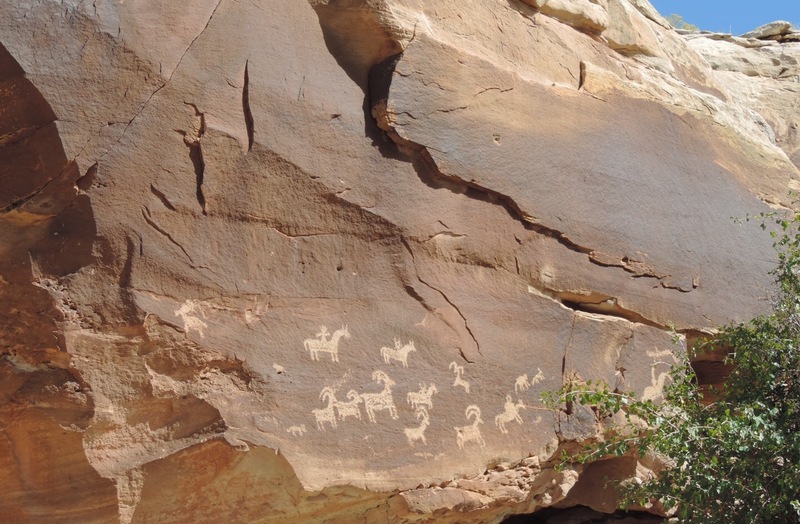 Another interesting activity was looking at the petroglyphs at a pullout to the east of the visitor center. The variety and size of the images leaves so many unanswered questions, but interesting to view. 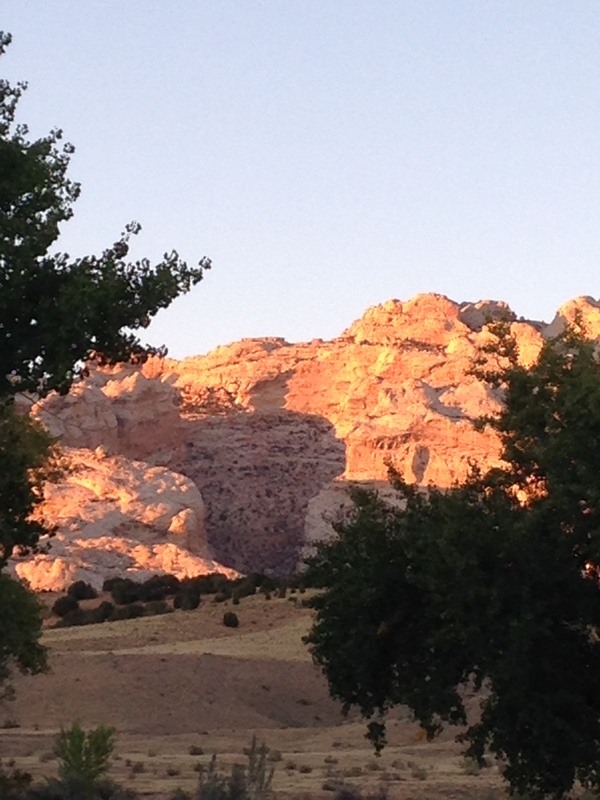 A unique feature of Capitol Reef is the Fruita district, just beyond the visitor center and along the 10 mile Scenic Drive. Fro. The early pioneer days there are orchards that the park service have maintained and are open to the public for UPick. The orchards that are available for picking have a donation box and scale for you to determine the price. 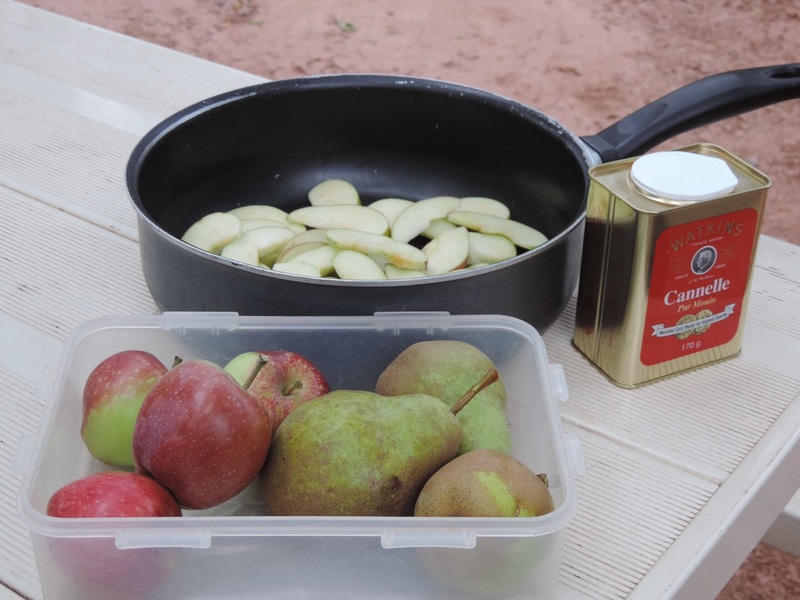 We enjoyed some fresh picked apples for dinner. Once I completed the required activites I returned to the visitor center. A very personable SCA staff member reviewed my booklet and awarded me the enhance badge and attractive patch.